It is with great joy that we announce the publication of the final book in the trilogy of Letters from 500. 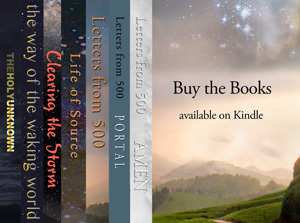 “Letters from 500 – AMEN” is now on sale at Amazon.com and we are certain that you will find this third book, in the dance of evolving consciousness, to be as compelling as the other two. In the days to come I will be posting excerpts from the pages of “AMEN” and I hope to hear your wonderful comments in response to your Soul’s resonance with these words and ideas. Remember, Divine Joy comes from the depths of your Heart’s Knowing Space and your Soul’s Oneness Merging.